Simple crafts for kids should be simple, yes, but fun also! 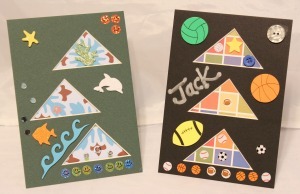 Have you ever thought of using mat board to create some simple crafts for your kids? If not - you should - it can be simple (VERY simple with our kits!!) and it can be a whole lot of fun! My girlfriend Tina and I have created some fun and creative kits for kids, using 5 x 7 mats. They are available for purchase from this page. They cost $4.99 (plus tax if purchased in NY) with a $2 shipping charge. Instead of the usual square or oval openings we're used to, we've come up with more interesting mats using 4 different patterns of triangles. Not only do they look different, but they bring out creativity in kids (field tested by Jack and Sydney!!) and, um - adults too - we had a lot fun making the samples! The beauty of these mats is that you won't need picture frames for them. They stand on their own, horizontally or vertically, using the included stands. 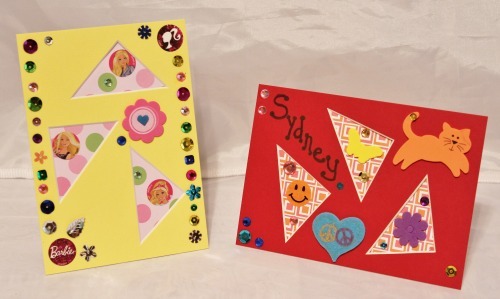 special "cards" for Mother's Day, Father's Day, Grandparent's Day, birthdays and so much more! Use the included supplies as well as your own markers, crayons, cut-outs and print-outs to have a lot of fun with unlimited possibilities! The sky is the limit!!! You can also use real pictures of family members, friends and pets. Simple crafts for kids don't have to cost a lot!! They just need to be simple and they need to be fun!!! Buy some now and thank us later! !